An educator in the Franklin County office of OSU Extension, CFAES’ outreach arm, Hogan has spent his 32-year career working with sustainable, alternative, organic, and small-scale farmers. For the past 21 years, he has served as Ohio state co-coordinator for the U.S. Department of Agriculture’s Sustainable Agriculture Research and Education (SARE) program; and for more than a decade he has partnered with OEFFA on the Ohio Sustainable Farm Tour and Workshop Series and on workshops presented at OEFFA’s annual conference. He is pictured in the photo with OEFFA Executive Director Carol Goland (photo: Ed Chen, OEFFA). 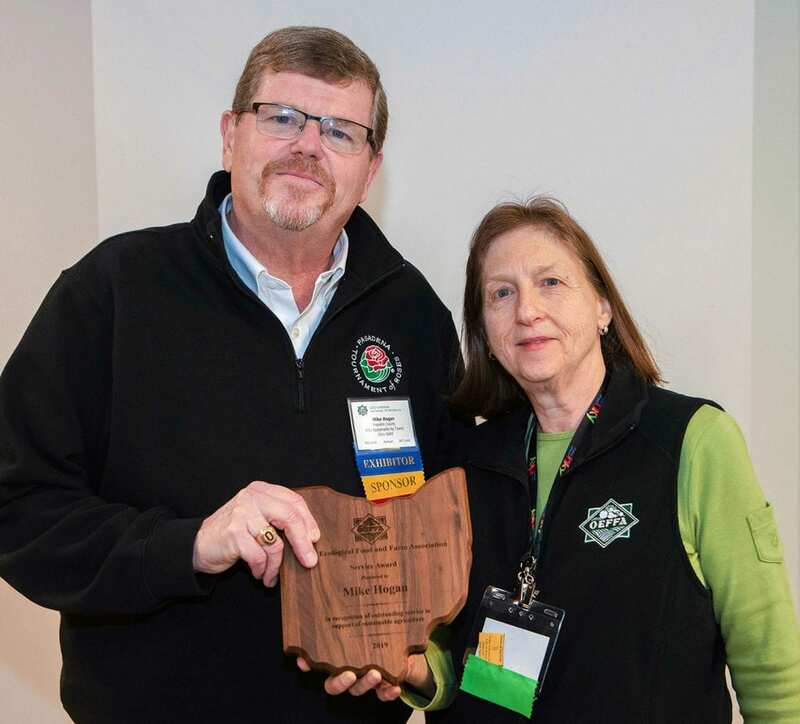 “Mike’s long-term dedication to family farming has been instrumental in increasing the acceptance, understanding, and adoption of sustainable and organic practices in Ohio,” SARE Outreach Specialist Sean McGovern said. Posted by Kurt Knebusch at 9:44pm February 19, 2019 Posted in On Campus, On The Farm and tagged organic farming, sustainable agriculture, urban farming. Bookmark the permalink.